Having access to price movements can help you optimise your sourcing and ultimately your profit margins. ICIS provides a broad coverage of synthetic fibre markets, including nylon, polyester, acrylic and more. What are the current trading prices? Are you sourcing your materials at the best price and at the best time? How will the overall trading dynamics affect your materials inventory, usage and pricing scheme? 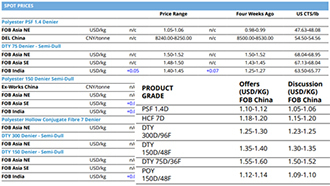 ICIS pricing reports provide regional price assessments of all key synthetic fibers traded regionally and globally. They are published weekly, enabling you to keep track of trading prices, understand price drivers/fluctuations and have a reliable benchmark for contract price settlements. 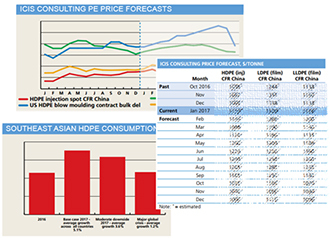 ICIS consultants forecast the likely trading prices for the coming 12 months, based on supply and demand dynamics and market developments. Will there be supply/demand imbalances over the long run that can push up prices of key synthetic fibres? 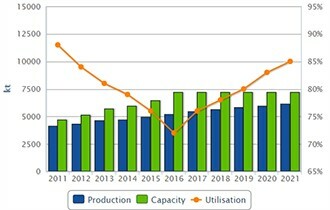 ICIS Supply and Demand data enables you to gain a mid- to long-term view of the synthetic fibres markets.